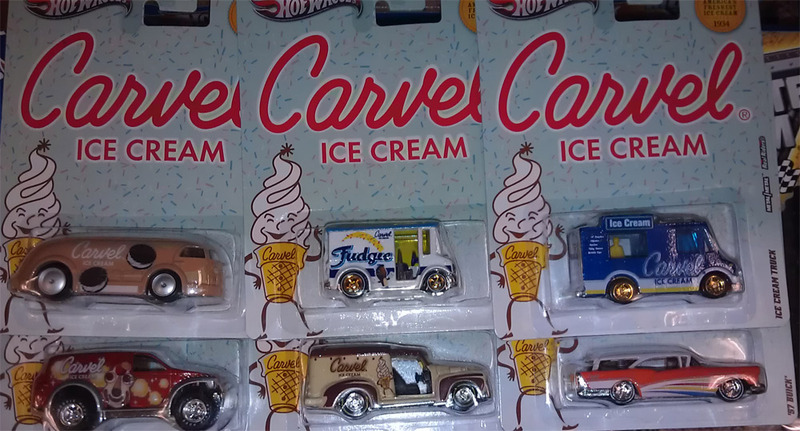 ...I want to drive a Carvel car! We saw these while wandering through Target today. It's a set of six Carvel inspired Hot Wheels "Classics" and they were tempting to buy... had they not been $4.49 a piece! 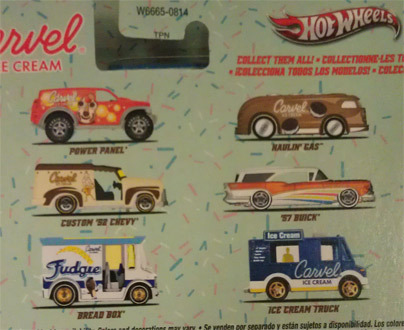 What a rip considering regular hot wheels were on sale for 84 cents. Where do they get off charging that much? I'm not sure the '57 Buick fits in, but whatever, it's all good.... except the price. This has nothing to do with ice cream, but I was excited non the less. Oh, and yesterday I was at whole foods. I pick up some on sale gelato and a special pair of west coast surprises (no, not Its-It), but I saw a few other things that caught my attention. 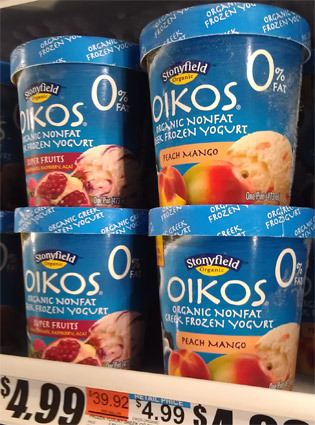 These don't say new, but I've never seen these two flavors of Oikos Organic Nonfat Greek frozen yogurt before. Peach Mango seems somewhat standard for a yogurt, but the Super Fruits certainly made me giggle a little. It's a high flying mix of Pomegranate, Raspberry, and Acai. That's right, my buddy raspberry worked his way in between two mega, ultra, super duper fruits. Whoa! 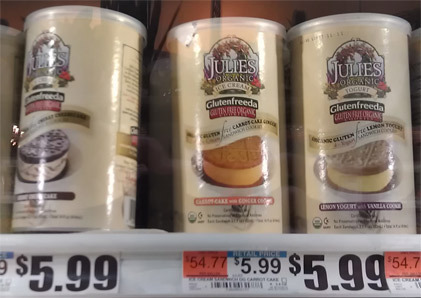 Are those "new" flavors of Julie's gluten free ice cream sandwiches? Hey, don't go, bear with me. Check out those flavors: Carrot Cake with Ginger Cookies and the other is Cherry Cheesecake. Hehehehe, now those are some mighty sandwiches! (the other one is the older lemon yogurt with vanilla cookies). I was very tempted to try these. 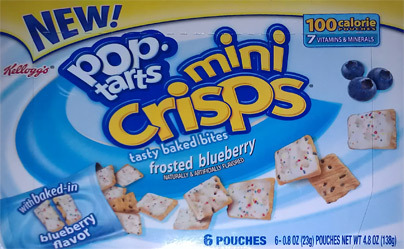 I wish they were individually wrapped or had a mixed pack. Ok, off to finish up a few reviews. Have a good day!